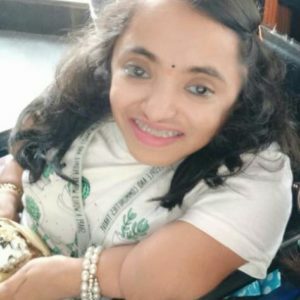 Indian Osteogenesis Imperfecta Foundation (IOIF) had an opportunity to interview Sirisha, a person with Osteogenesis Imperfecta. 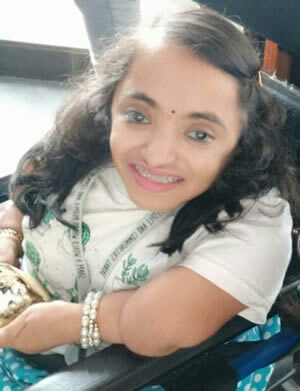 In an hour-long conversation with Sirisha, we got to know about her life and its finer details and how despite all odds she continues to work independently in Bangalore away from her parents and homely care. This post attempts to capture the eventful life of Sirisha and intends to spread the message to families and people alike that the greatest truth of life is our inner strength in front of which every seeming incapacity crumbles and surrenders. Sirisha was born in Chittoor town district in Andhra Pradesh in the year 1988. The medical staff was not aware of OI and handled her as they would handle any infant born without OI. During birth she experienced multiple fractures in several parts of her body. However, a recognition of underlying cause could not be made and Sirisha was continuously writhing in pain. Observing these incidents, the doctor advised to take the baby to an orthopaedic doctor. 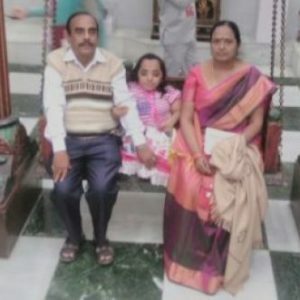 Within 30 minutes, as the orthopedic doctor checked her, Sirisha was diagnosed with Osteogenesis Imperfecta. 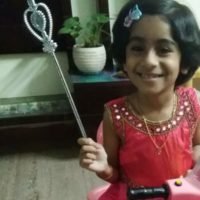 With the hope to find a cure for their daughter, Sirisha’s parents took her to several hospitals like NIMS Hyderabad, Vijayawada orthopaedic center and AIIMS. The diagnosis, however remained the same and was confirmed by all the doctors. By this time the family had understood that there was no cure for the condition. Growing up she was home-schooled till 7th class mostly by her mother. It was in her 7th class that she went to school for the first time to write exams. She eventually succeeded in writing her 10th class exams but after that there were some challenges in getting admission to pre-university. After concerted efforts from her family and with the support from school management she was able to get permission to appear in exams and continued to be homeschooled. She had opted for Commerce stream. She enrolled in BCom(computers) and successfully finished it. Post graduation she enrolled for an MBA and simultaneously she was also preparing for some competitive exams. Eventually, she joined a private firm as a data entry operator and handled multiple responsibilities including that of customer care executive, quality analyst person and also a mentor to people with special abilities at the workplace. She worked there for 3.5 years and currently she is working in a foreign bank. The biggest decision Sirisha took was to move out of her hometown and come to Bangalore. Her father was a big force behind this decision. She clearly remembers what he had said, “Now that you are a grown up adult, you need to learn to take care of yourself”. It would not have been easy for him to say that to Sirisha, he knew the challenges involved, yet he encouraged his daughter to explore and experiment with life in her own personal ways. Additionally, the motivation behind this decision she says was also to prove herself and to provide a peaceful response to those people who had objected to her education while growing up. Sirisha mentions that she had to hear statements like – “What is the point of writing exams? She has to be carried all the way to the school. What is the use of education to her?” and much more. Who would have thought that this girl would be using all these doubts to cultivate inner strength and moulding a dream? With exemplary demonstration of positive rebel attitude Sirisha has managed to turn those anxious about her life and future into her admirers. Obviously it was not as easy it sounds on reading; growing up and embracing her condition involved momentous efforts and an attitude change. Imagine a girl with OI coming to Bangalore on her own and setting up a comfortable dwelling. She currently lives in a paying guest accomodation with the help of a caretaker. 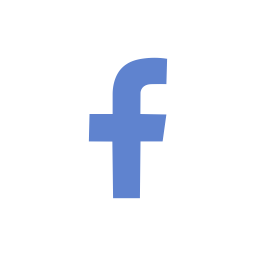 “Why do you think the child has a critical condition? The child needs little bit extra care and the responsibility ought to be to nurture the child such that he/she can live independently at any cost. In that respect, education of child plays an important role. See that you are making your child fiercely independent”. 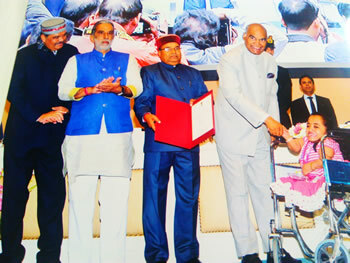 Sirisha is also a National Awardee in the Best Employment category. IOIF thanks Sirisha for sharing her valuable time with us and letting us know about her life. Sirisha’s life is a testimony to the fact that OI does not have to stop anyone from becoming a useful asset to the society and lead a life of financial independence and social dignity. IOIF is also immensely proud of Sirisha’s parents.